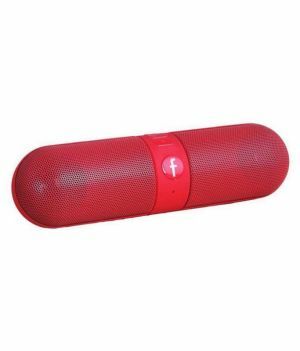 The Beats by Dr. Dre Pill Portable speaker is a compact, lightweight music player that is ideal for travelling. Uniquely shaped like a pill, it is designed to resemble an elongated version of a mini cylinder and comes in a striking black colour. The patented Beats logo initiates Bluetooth connectivity after being pressed for about three seconds and turns red to indicate pairing. A matte finish, rubbery rear protects these speakers from slipping and falling. Encased in a mesh like metallic grill are four powerful driver speakers. It is also equipped with NFC (Near Field Communication). Despite its compact size and pill shaped design, this Beats portable speaker delivers loud and impressive sound quality and clarity. Get ready to be amazed with the method by which this Beats Bluetooth portable switches seamlessly from high frequency sounds to low bass tones. Each music genre, be it rock, blues, metal or classic is handled to give justice to the song and its music. The Beats Bond can amplify your music to produce a balanced, smooth sound, free from distortions for your hearing pleasure. Listen to deep, thunderous bass tones with this speaker. Perhaps the most appealing feature of this portable Bluetooth speaker is the super fast Bluetooth connectivity option. Pair your Bluetooth compatible mobile phones, tablets and music players by simply tapping it on the Beats Pill to form a strong connection. To stereo your music, tap your digital device twice on the Beats Bluetooth speaker. It is compatible with Apple products like iPhones, iPod and iPads. You can control the music and volume level directly from your phone with this Bluetooth connection which can extend up to thirty feet away.